What a start for Bangladesh. After the initial loss of Nazimuddin Bangladesh went on the offensive. 47 runs in 12 overs has meant that they have an immediate platform to build on. Sammy was worried enough that he brought himself on to bowl after only 4 overs. Often captains over bowl themselves, but if anything Sammy underbowls himself in helpful conditions. There is not much pace in this pitch, but Sammy probably brought himself on more to dry up runs than to take wickets. Whatever the idea was, it didn't seem to work, as he had 0-16 off his 4 overs. Captain Sammy strikes back! Perhaps he did have a plan when he brought himself on to bowl. I would hazard a guess that that was the first time that Tamim Iqbal has ever been bowled without playing a shot. I certainly can't see him repeating that mistake too many times in the future. Bangladesh seem to be intent on not allowing this game to go into the fifth day. They have taken an all out attack approach to the day's play. The upside of this is that they will have plenty of time to bowl West Indies out. The downside is that they are unlikely to put together a big score. One impressive thing is that despite the barrage, Darren Sammy has kept the field up. Traditionally he had conceded more single runs than boundary runs but he has obviously been less afraid to concede boundaries, and instead is still attacking. Take a bow Abdul Hasan. A previous best first class score of 61, and he goes out and hits a magnificent 100 off 106 balls on test debut. That is really some fairy story. Bangladesh now have the opportunity to score over 400 in two consecutive matches for the first time in their history. Perhaps throwing the bat at the ball was a good tactic after all. While Bangladesh have won the most hours, West Indies are probably slightly in the lead in the match. They need a big score here, however, as they are going to have to bat last on this pitch, which is already starting to keep low, and Sohag Gazi seems to be a quite tricky customer. At the same time as Australia are hitting the South African bowlers to all partsin Adelaide, the West Indian batsmen are content to gradually accumulate their runs against Bangladesh here in Khulna. There don't seem to be too many terrors in this pitch, so Bravo and Samuels are being careful to make sure they don't get themselves out. I'm not sure how long they will keep this up. It will be interesting to see how long they can rein in their natural games. Another steady hour from the West Indies. Samuels is starting to get into the swing of things quite nicely, where as Bravo seems to be almost batting himself out of form. Not hitting the bad ball to the boundary is not somehow being disciplined, it's actually just bad batting. Perhaps there was method to Bravo's madness. This partnership may have scored at a paltry rate of 2.85 an over, but both batsmen are still there. Marlon Samuels has never scored a big century. This is his 5th time reaching 100, but his highest score is still 123. He is having a fantastic year with the bat, (he's only scored less than 50 four times this year) but he really needs a big hundred to top it off. Perhaps tomorrow is his chance. Whatever Marlon Samuels had for breakfast today it had a different effect to yesterday's meal. Yesterday he scored 109 from 231 deliveries. Today he has scored 80 off 77. He has finally got past the "just got to 100" stage and is starting to build a big innings. This could be a long day in the field for Bangladesh. A double century for Samuels, his first in tests and third in first class cricket. However when the wicket fell, the match was set up for ready for someone to come out and attack. Instead Chanderpaul came out and scored 10 off 43. Not really what the situation called for. I take back my slight on Chanderpaul. He was obviously just getting his eye in. And now that he is seeing it he is hitting it. Now that even Chanderpaul is going for it, we could be in for some fireworks. 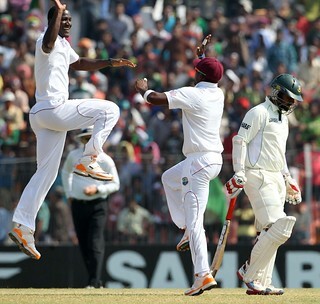 West Indies have mixed attack and defence well to put together a large lead. Three century makers already, and they still have 6 wickets in hand. Samuels worked hard for his 260. It has been part of a trend of dramatically improved performances with the bat for him since October last year. Before then he averaged 29, since then he has averaged 62.38. That is a phenomonal transformation. He is fourth this year (at time of writing) on averages (given at least 10 innings). He is really starting to repay the patience that the West Indies selectors showed him earlier in his career. West Indies are in a dominiant position now in this match. The only hope that Bangladesh have is that they could bat out the whole day and hold out for a draw, or that there would be a freak weather event. Neither of these seem even remotely likely. Bangladesh have managed to avoid the innings defeat. However they will not be happy with the way that some of the wickets have fallen. There have been some very injudicous shots. That brings a close to a game where Bangladesh have been willing, aggressive and somewhat brainless. West Indies have been clinical. I'd assume that Samuels will be man of the match, although Tino Best deserves credit for the fantastic 5 wicket bag in the second innings.